Xi Dian Experimental Primary School in Xi’an, China, began its immersion program in September 2005 with two immersion classes at Grade 1 when it joined the China-Canada-USA Collaborative English Immersion Project (CCUCEI). The 2007-08 academic year is the third year the school is offering an immersion program, with a total of eight immersion classes, three at Grade 1, three at Grade 2 and two at Grade 3. There are a total of five classes in each grade level at the school. The school has a history of over thirty-five years but its immersion program is relatively ‘young’. The school community, including the school management, teachers, students and parents, is very enthusiastic and positive about the program. The school is hoping to offer the immersion program up to Grade 6 by 2010 for more than 800 students. 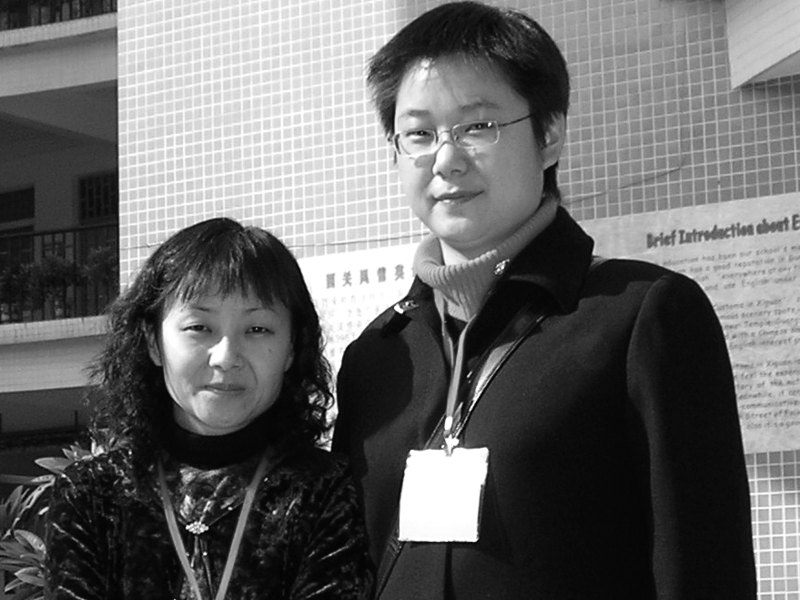 Stella Kong, seen here, left, with Li Mingming from the Xi Dian Experimental Primary School. The CCUCEI project started in Xi’an in 1997 in a few kindergartens and has now expanded to include about 20 kindergartens, 17 primary schools and 4 middle schools in Xi’an as well as to other cities in China (see article by Philip Hoare in The ACIE Newsletter, 2007 February issue for more project details). In recent years in China competition between schools has increased greatly. Before immersion was introduced, Xi Dian Experimental Primary School had to go to the suburban areas around Xi’an to find enough students for Grade 1 classes. With the introduction of the immersion curriculum, thousands and thousands of parents are lining up outside the school every April-May to register their children for the screening tests. The massive demand for English in the midst of the rapid social, economic and political development in Mainland China has led many schools to provide more and better English. Recognizing that the English language curriculum focuses too much on learning linguistic knowledge, the CCUCEI project aims to provide students in schools with a language learning experience that will help them use English, especially spoken English, in authentic contexts. Xi Dian Experimental Primary School joined the project with this aim in mind. At the same time, the school hopes to broaden teachers’ and students’ horizons, enhance the professional standards of the teachers involved, and enrich curriculum resources of the school. The school sees immersion as a challenge to every sector in the school and an opportunity for the school to grow and develop through implementing a curriculum initiative. The school currently offers partial immersion in three subjects: science, moral education and integrated English where English is used to teach subjects such as music, art, and physical education (as opposed to standard English classes where the subject taught is the English language). Students’ first language, Chinese, and Chinese literacy are taught from Grade 1 when the immersion program starts. 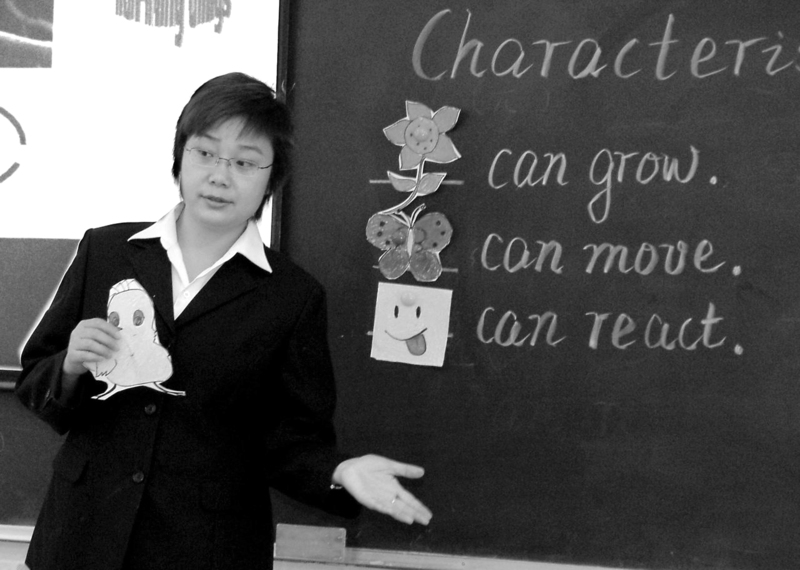 Li Mingming, a teacher at Xi Dian School, teaches a Grade 3 science class in her English immersion classroom. As immersion is a very new approach in China, teachers have few models to follow and have to experiment with classroom teaching techniques within the immersion framework. These are sometimes very different from those employed in ‘standard’ English classes. Students are expected to use only English in immersion lessons as they go higher up the grade levels though some Chinese is accepted. The focus is on the use of spoken English, with content used mainly as a tool to facilitate use of English. Motivation is high and this is a key aspect of the program’s success. Teachers never discourage students from trying out the new language and mistakes are accepted as part of the learning process. All students’ work, not just the very best, is displayed around the classrooms to encourage and motivate students. Strong motivation among students leads to high response levels and when the teacher asks a question, most students are keen to try to answer. During group or pair work, students turn immediately to the task, using the target language. While these more student-centered activities may be everyday occurrences in Western schools, they are not common in mainstream English lessons in China. Management of these activities is not easy in a large class but they are seen as important features of the program. As immersion is still a very new approach in the school and indeed in China, there is no standardized language test available. There is, however, recognition that formative assessment is more helpful to students’ language development than summative evaluation. Students are given some English homework to do every week and this is viewed as one way to monitor their learning. Every month, students are also given a self-assessment form in which they or their parents have to report on how well they have been learning English, whether they have been working collaboratively with a partner, what problems they have encountered, and so on. The parents are very supportive and have high expectations for the level of English their children can develop through participation in the program. Much of the impetus for the adoption of the program came from pressure from parents. The school sees their cooperation and support as an important factor in its success. Regular meetings are held with parents to help them better understand the program so that they can more appropriately support their children’s learning. Teachers welcome feedback from parents to more clearly understand how their students are progressing and how they are feeling about their learning. Every semester, there is an open class day when parents are invited to come to observe their child’s immersion lessons. In these lessons, the teacher will try to involve parents, for example, by having students write a card to send their love to their parents. A key success to any new curriculum initiative is teacher training. The CCUCEI project helps a lot in this respect. The project team organizes regular meetings with the immersion teachers in all the primary schools participating in the project. Every two weeks a member of the project team visits an immersion class in one school to observe a lesson and to discuss the lesson with the teacher. One teacher from each participating school is also expected to join the observation and discussion. The school provides a great deal of support to the immersion teachers. All immersion teachers are free of classes each Thursday afternoon. This provides them with a common timeslot to meet and discuss teaching issues and strategies. This also allows them to participate in the regular observation schedule across schools. Teachers are encouraged and subsidized to attend any relevant teacher training workshops. The immersion teachers also receive a monthly personal bonus from the school as acknowledgement and encouragement of their efforts. The school holds at least two planning and evaluation meetings each semester with all immersion teachers to evaluate the success of the program and to set directions for future development. The school is currently very proud of the students’ English, especially spoken English. They feel that the oral English proficiency of students in the immersion classes is clearly a lot better than that of students in mainstream classes. There is a particular contrast between the immersion students’ confidence and willingness to use English with one another and the non-immersion students’ reluctance to talk. Immersion students even seek opportunities to use English outside class and are not afraid of speaking in English to foreigners. When foreign visitors involved in the CCUCEI project visit the school, some students will seize the opportunity and approach them to talk, feeling justifiably proud of themselves for being able to do so. 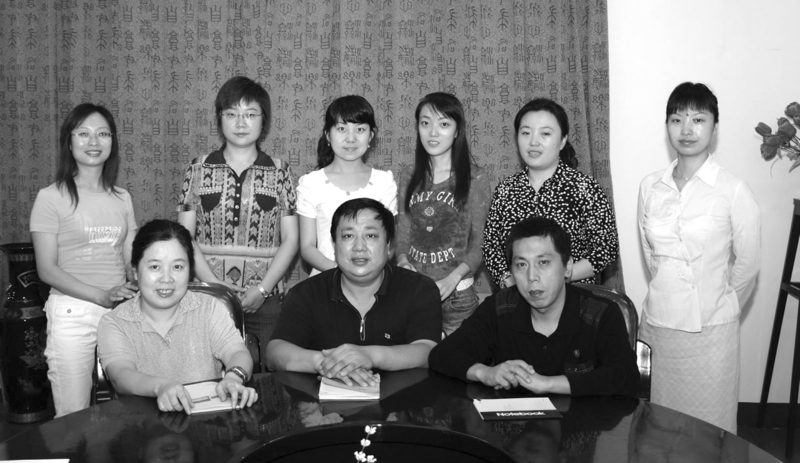 The School Management and the Immersion Teaching Team at Xi Dian. The school feels strongly that the teachers have benefited greatly from their involvement in the immersion project. The school management also feels that their own management skills have been enhanced through having to consistently work out ways to overcome problems in implementing an extremely innovative curriculum in the context of China, where curriculum innovation has only recently been encouraged. Nonetheless, the school is aware of the challenges yet to come as the program moves into the upper grade levels. The content will become an increasing challenge to specialist English teachers who, while best equipped to teach the immersion classes because of their language skills and professional training, are not trained to teach subject content. This means that teacher development will continue to be a focus. It is expected that the immersion program will continue to grow to Grade 6 with a total of 18 immersion classes, three at each grade level. This is sure to make recruitment of qualified teachers a considerable challenge.